Description:- Frankford Lucas is the chief superintendent in the police force. He is well respected and well thought of… however, he has a secret. Ever since childhood he has visited The Quiet Road in his dreams. He thought it was a good place, this Quiet Road, but events unfold to prove otherwise. Gruesome murders are being carried out on his patch and trophies turning up in his flat with no rational explanation. Who is slaughtering the innocent victims and why? Profiler Lenny Docker introduces a clairvoyant into the investigation and The Sarsaparilla Duchess, seems to know more about Frankford Lucas than she should – even more than he does himself! In time Frankford Lucas learns the true secret of The Quiet Road and realises he is dealing with a force beyond his control. Can he save his soul from darkness, and can he save the souls of others who cannot help themselves? The Road is long as is the investigation leading the reader on an intense journey they will not forget in a hurry! Review:- I loved Annie’s first book Imprint, check the review here. Her second book did not fail to disappoint, I read this book in one day I could not put it down. 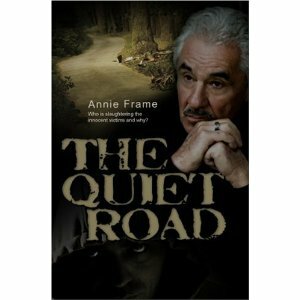 Anne Frame writes from a personal knowledge base but invites the reader to be open minded and does not asked to be believed. The story is written from the perspective of the main character Frankford Lucas a chief superintendent in the police the setting is London. You feel as if you are getting to know him as basically a solitary man who likes his own company and feels more at home in a dream world where every night he travels down a quiet road and dreams. This novel seems to exist in part on two levels the everyday life at the office and characterisation of his colleagues and his unusual dream world. It becomes apparent that there are messages in his dreams relating to a series of murders where trophies turn up in his flat. He learns details about the murders from the victims in his dreams who informs him, he was there.He keeps the information to himself then tries with his colleagues to solve the crimes. He is under the impression that he is not involved in any of the murders and is just being contacted by the dead, but it is not as simple as that. The novel progresses a medium and clairvoyants are added to the mix. The spirit world is explored where good, evil and reincarnation are central to the thread running through.Can he save his soul and others from darkness with the help from both this world and of another. This novel leaves room for a great deal of thought relating to perceived insanity. Are individuals suffering from multiple personalities syndrome where they are not in control of their actions or is it the work of evil entities? An interesting read that leaves you with more questions than answers. I would recommend this to adult readers who are curious about mediums, clairvoyants, spirits or into a spooky read. This is a great read, which will leave you a little spooked and wanting more.